Now there’s a handy little gadget that can add a new dimension to your lighting design, while giving you extra space to hang more fixtures on your truss rig. American DJ has introduced the Mini-O-Clamp, a 360° wraparound tube clamp that easily attaches to ¾ inch / 20 mm truss. Designed to fit on horizontal and diagonal truss braces, the Mini-O-Clamp can hold lighting fixtures up to 20 lbs./ 9 kg. safely and securely. Quick and easy to install, it allows you to utilize this previously unused “brace space” to hang additional fixtures and expand your light show – without having to spend money on more trussing and components. Plus, with a greater choice of vantage points to rig from, designers can get more creative in positioning their lights. 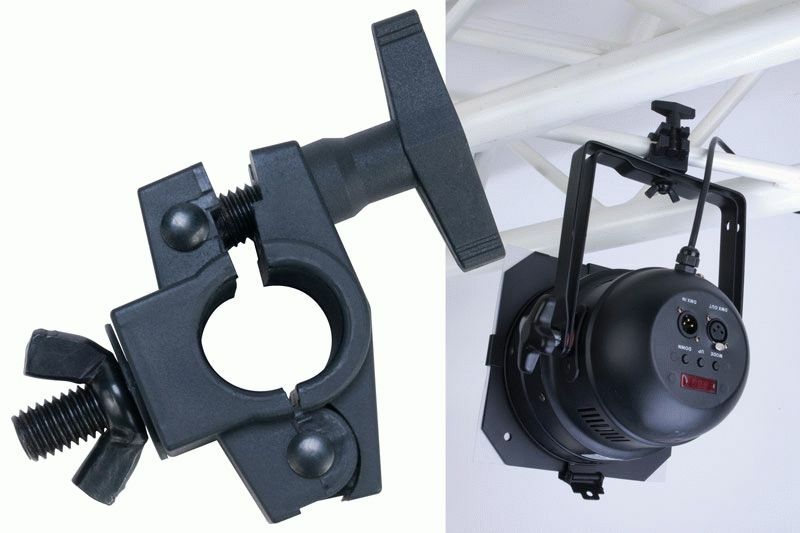 The Mini-O-Clamp can be attached anywhere on the truss brace, so you don’t have to work within the typical confines of a truss structure, but can literally take your light show to a new dimension. Small but sturdy, the Mini-O-Clamp is also great for securing truss warmers that are mounted inside trussing. No more twisting and turning to get truss warmers in place – with this versatile little clamp, you can quickly attach a truss warmer, position it at any angle you choose, and be assured that it’s securely fastened to the truss. “With a list price of just $5.95 per clamp, the Mini-O-Clamp might be the best investment a lighting designer or entertainer can make in their light show,” said Scott Davies, General Manager of the American DJ Group of Companies. “It instantly gives you more space to hang lights on your rig, and it gives you complete flexibility as to where to position them. Using the Mini-O-Clamp is simple – you just wrap it around the truss brace and screw into place from the base of the clamp. Another screw at the tip of the clamp easily attaches to the fixture’s hanging bracket. Rugged and durable, the Mini-O-Clamp will stand up to the rigors of everyday use, and it will not cause any scratches, dents or other damage to the trussing or the fixture. The Mini-O-Clamp is designed for use with fixtures that have a maximum weight of 20 lbs./ 9 kg. The MSRP of the Mini-O-Clamp is $5.95.